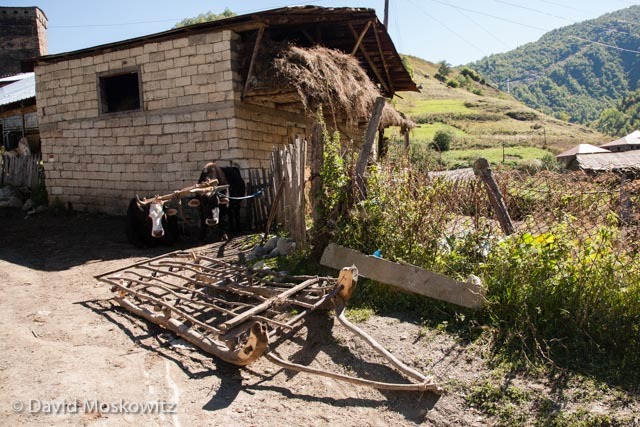 September is harvest season for folks who live in the Sveneti Region of Georgia's Caucasus Mountains. The Caucasus Mountains are a land steeped in history and located at a geographic and cultural crossroads of Asia and Europe. 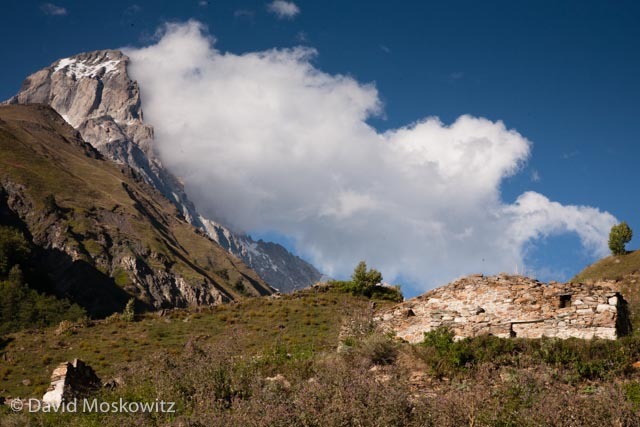 Traveling through the remote villages situated among the soaring ridges and peaks of the Caucasus Mountains, felt at points like a trip back in time. This feeling was perhaps most distinct in watching the process of cutting and storing hay which was in full swing during my time in the region. Three men from the village of Iprali work in concert cutting wild hay in a high elevation meadow in the Sveneti region of the Republic of Georgia. Careful attention to keeping you blade sharp is required for cutting hay with a scythe. Men will typically sharpen their blade after each row of hay they cut and the distinctive sound of sharpening stones against the metal blades of scythes rung out across many of the mountain valley’s we traversed during our fall travels in the region. Often, hay is carefully collected into mounds which are left to dry before being hauled back to the village and stored for the winter. 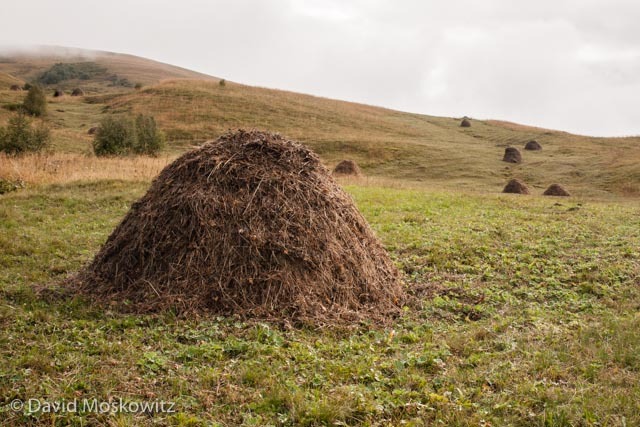 Hay mounds dotted hillsides up and down the mountainsides across much of Sveneti during the fall. Caucasus Mountains, Republic of Georgia. Hay mounds are eventually collected and loaded onto either trucks or wooden sleds pulled by cattle to be hauled into the village. Hay being hauled out of the mountains to the village of Ushguli. Sveneti, Republic of Georgia. A wooden hay sled sits in front of a modern barn built with a traditional design, while two cows rigged for hauling it rest in the shade. Hay is stored in the top while livestock are penned below during the winter. Sveneti, Republic of Georgia. 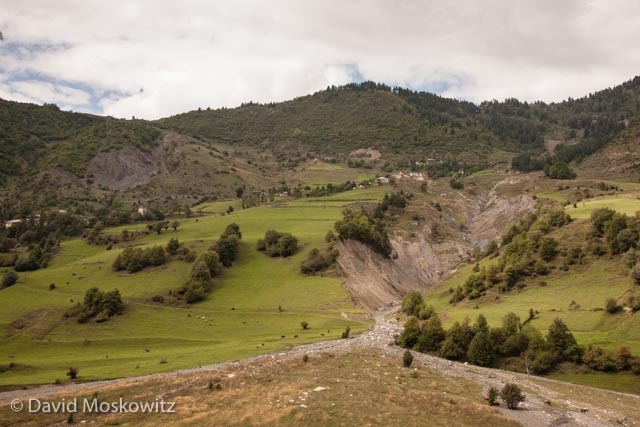 A massive and growing ravine sits on the edge of a village in Sveneti. 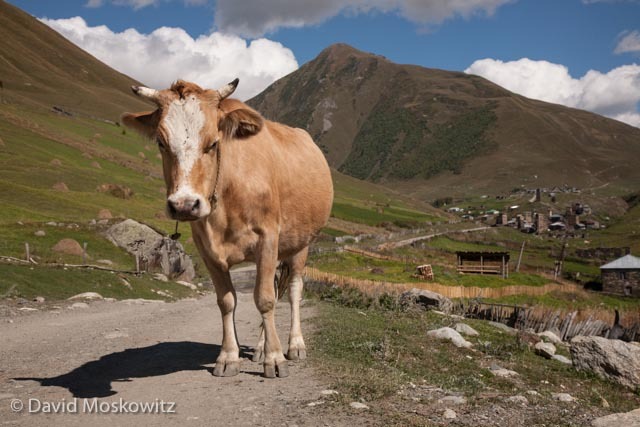 Intensive and long term cattle and other livestock production have left many hillsides scared with with such erosion, while thistles and other weedy species that tolerate heavy grazing pressure flourish in much of the range lands in Sveneti. Part of the welcoming committee for the village of Ushguli. On our walk into the village we were also greeted by a horse, several pigs, and a very large but quite amiable dog. Caucasus Mountains, Republic of Georgia. The massive relief of the Caucuses Range in the the Republic of Georgia's Sveneti Region are staggering in their own right for their sheer natural beauty. Though much less well known then the Alps in western Europe, the Causcuses, straddling the southern border between Europe and Asia are the highest mountain range in Europe. During the first part of my recent trip to the region, I spent several days trekking around Mount Ushba, one of the most striking mountains I have ever encountered. Like most of the highest peaks in Georgia, it sits along the international border with Russia. 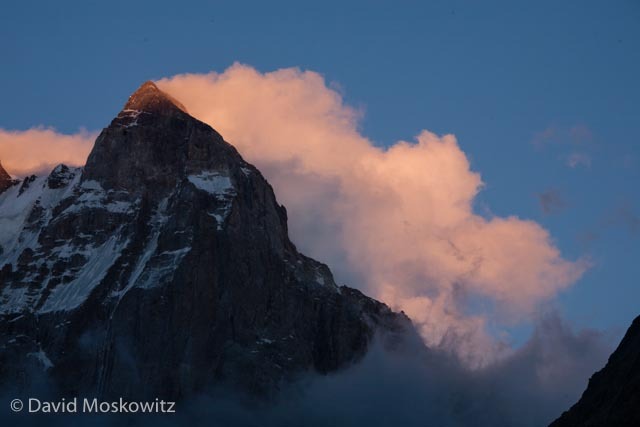 Though not the highest peak in the range, at 4,710 m (15,453 ft), Mount Ushba is a massive peak and generally considered the most challenging mountaineering objective in the range. Seen hear at sunset with a steady stream of clouds forming and streaming off of the lee side of the summit. Mount Ushba (left), neighboring Mazerie Peak, and the massive rock covered lower portion of the Ushba Glacier photographed via moon and starlight. Murky waters pour out of the snout of the Ushba Glacier, one of the headwaters of the Inguri River, one of the largest and economically most important river in Georgia. Intrepid traveler crossing the ragging glacial outflow several miles downstream from the snout of the Ushba glacier in the Republic of Georgia’s Sveneti region. The torrent of water pouring over the glacier carved cliffs bellow Mount Ushba have carved out a deep ravine into the landscape. Svaneti Region, Republic of Georgia. The Shkhara massif sits south and east of Mount Ushba and includes Mount Shkhara and several other 5000+ meter peaks, the highest part of the Caucuses in Georgia. Fall temperatures had turned the mountain ash red on the alpine mountain slopes and dusted the ridgetops, peaks, and glaciers with fresh snow. The massive bulk of Jhanga peak and Mount Shkhara from the west, drapped in ice and fresh snow, give birth to another tributary to the Inguri River. Sveneti Region, Republic of Georgia. A rainbow straddles the mountain valley and snout of the valley glacier flowing off of the Shkhara massif. Georgian Caucuses Mountains. 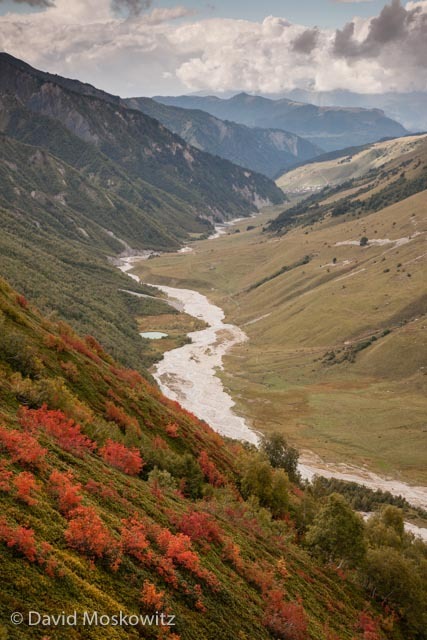 Mountain ash’s brilliant red-orange after the onset of fall temperatures above the glacier fed river leading down to the tiny and remote village of Adishi. Sveneti Region, Republic of Georgia. The Lamaria Church, near the town of Ushguli, with the southern face of Mount Shkhara, 5,193 m (17,040 ft), in the background. 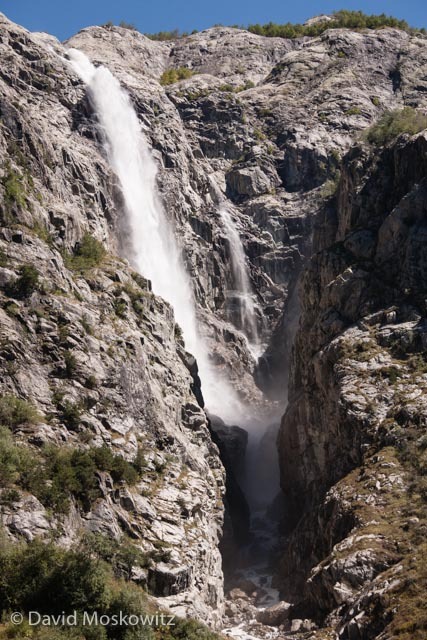 Downstream, the impacts of primitive sewage systems, unbelievable garbage disposal practices, unfettered livestock access, old mining activity, and a massive hydroelectric dam take their toll on the Inguri River, but here at its headwaters it flows free and beautiful off of some of the highest peaks in the world.